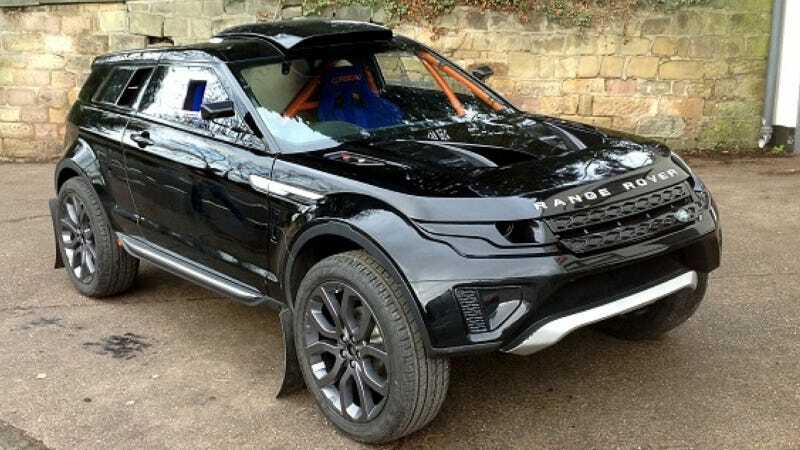 The blokes at Autoblog are pretty much convinced they've placed the identity of the Evoque rally car we found in the Chinese patent books, and I'm inclined to agree with them. Land Rover confirmed to Autoblog they have not applied for a Chinese patent that resembles a rally car, and this LRM-1 from British tuner Milner is visually a dead ringer. Though the LRM-1 looks like an an Evoque, it's actually a completely custom space-frame chassis vehicle built by Milner themselves. It's about 20% smaller than an Evoque, and is powered by a Land Rover 5 liter supercharged V8 making "in excess of 550BHP and [500 lb/ft] of torque." A six speed sequential transmission puts power to the wheels through a transfer box and diffs that Milner also makes. They sell the vehicle as a turn-key race car, or a roller ready to accept any engine a buyer can fit. Unfortunately Milner's away message says they won't be able to get back to us until January 20, but every vent and tube seem to match up. Take a look for yourself and let us know what you think.